Żyrafa kindergarten has got its own bus (Żyrafa bus) which, at the parents’ request, may bring their children, accompanied by the teachers, to the kindergarten and back home. We also take our Żyrafa bus to participate in additional activities outside the kindergarten (such as swimming, tennis and horse riding) and when we go for trips. 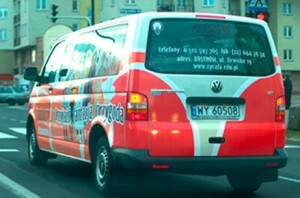 Our Żyrafa bus is a nine-person Volkswagen Transporter equipped with safety belts for all passengers. At parents’ request, children may be collected from their homes (or parents’ workplace) and delivered to the kindergarten. Żyrafa bus arrives at the child’s home at prearranged times. 350 PLN per month – a permanent order for one drive per day throughout a month. Reservation and payment of fee before the first day of the month concerned is obligatory. 450 PLN per month – a permanent order for two drives per day throughout a month. Reservation and payment of fee before the first day of the month concerned is obligatory. 35 PLN per day – a one-off order for one drive per day to be paid the following day. 45 PLN per day – a one-off order for two drives per day to be paid the following day.